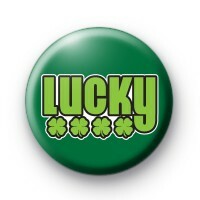 I Feel Lucky Shamrock Badges in green with the text Lucky written across it and 4 green shamrocks below. Standard 25mm button badge hand made in our UK workshop. We have loads of St Patrick's Day badges to choose from so be sure to checkout the rest of the category.